Go long following some bullish price action on the H1 time frame immediately upon the next touch of 0.7985 and 0.7054. Go short following some bearish price action on the H1 time frame immediately upon the next touch of 0.7139 or 0.7175. I wrote yesterday that the odds were probably still very weakly win favour of another rise once the price turns, maybe to 0.7139. If the price could get established above 0.7139 it would be a bullish sign. There was no medium or long-term trend in this pair so it could be difficult to trade profitably. This was an OK as although the price fell, it didn’t go very far before recovering, and continues to be held by an even narrower band from support to resistance. There is no direction here on any time frame except the shortest. 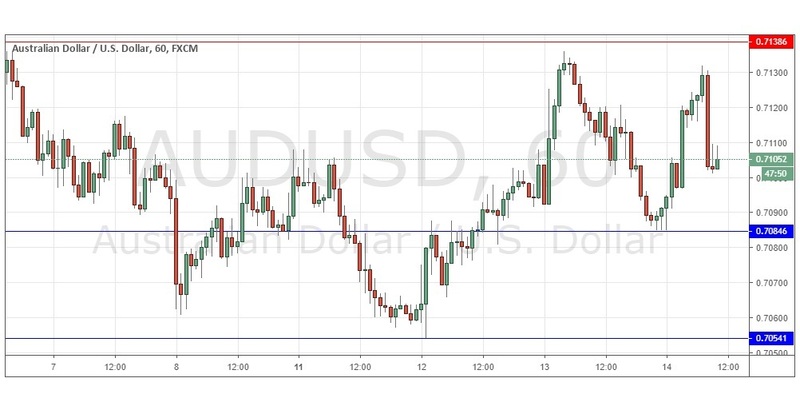 This indicates that the best opportunities which could arise here in this pair are fast reversals on short time frames at the extremes of price at 0.7054 and 0.7139.There is nothing of high importance due today regarding the AUD. Concerning the USD, there will be releases of Retail Sales and PPI data at 1:30pm London time.